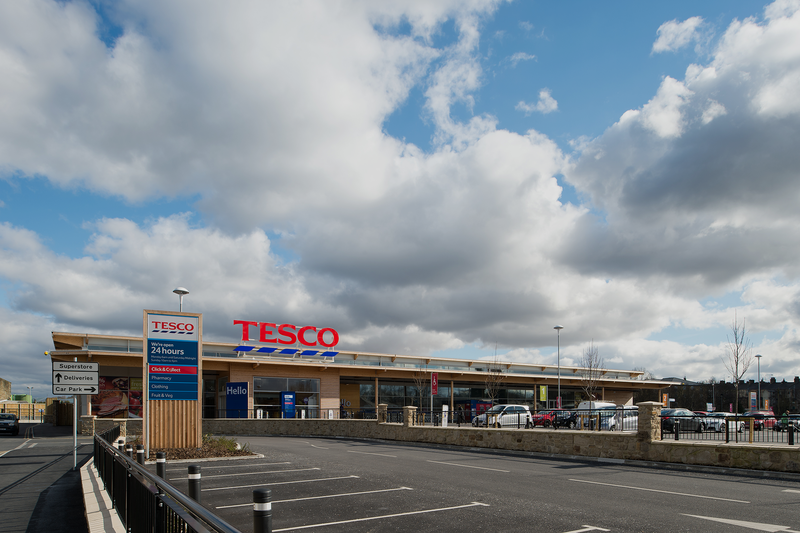 The development comprised a 48,500 sq ft Tesco Eco store with a 240 space car park and two retail units on an edge of town centre site. The site was previously occupied by five commercial businesses in six ownerships and the complicated site assembly was achieved by private treaty negotiations over several years. All of the businesses were successfully re-located, three into adjoining properties and the remaining two elsewhere in the local area. The 40 week construction programme, by Eric Wright Construction, involved extensive demolition and reclamation, with a significant quantity of reclaimed stone from the demolished former mills utilised in boundary walls. The store, which opened in October 2012, incorporates many “green” features including a glulam structural frame, larch faced timber cassette units to walls, rainwater harvesting and large rooflights to provide natural daylight and reduce lighting requirements.